Amir Khan (31-4, 19 KOs) is starting out the New Year in style, predicting that he’s going to clean out the 147 pound weight division from top to bottom. Khan has his eyes on WBA/WBC welterweight champion Keith Thurman and IBF champion Errol Spence Jr. as his first 2 immediate targets in his sights. Beyond those 2 champions, Khan wants to avenge 2 of his past defeats to Danny Garcia and Lamont Peterson. Khan was beaten by them 5 and 6 years ago respectively. Khan says he’ll be fighting in late March. This fight will prepare him for a big step up against possibly Thurman, Spence, Garcia or Peterson. Khan’s chances of getting one of those fighters to agree to a fight with him would figure to be high. Al Haymon is Khan’s adviser. He might choose to match him against someone else besides those fighters. Adrien Broner would be a very good opponent for Khan, as would former IBF welterweight champion Kell Brook. Khan vs. Brook would bring in a lot of money if the fight takes place in the UK. The 31-year-old Brook has been asking Khan for a fight for a number of years. This would be a good time for Khan to finally take Brook up on his offer before the opportunity slips away for good. ”I’m going to clean up the division, and I’m going to become world champion again. Mark my words,” said Khan via Fighthype.“I’m going to be fighting around March, maybe towards the end of March. I’m inspired. I’m motivated. It’s time to get back to work again and do what I do best, and get back into the ring. 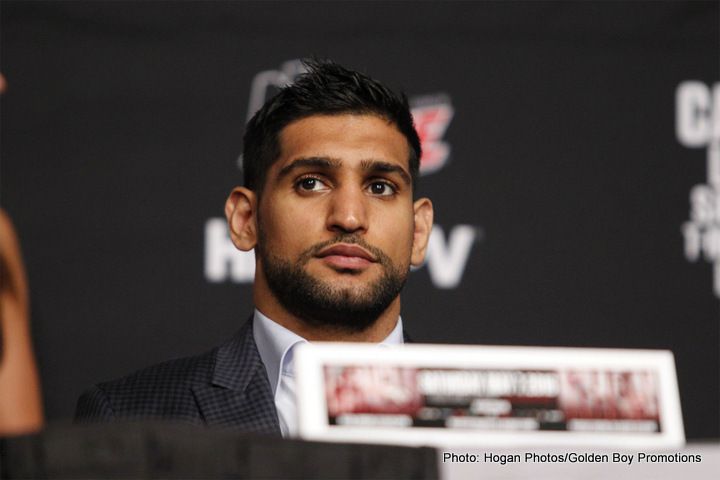 It’s time for another world title,” said Khan. It’s nice to see Khan showing interest in fighting once again. He fought against Saul Canelo Alvarez in 2016, but he was stopped in the 6th round. Khan put in a game effort in that fight, showing off his hand speed and boxing skills. Khan got a little careless in the 6th round and was nailed by a right hand from Canelo that he never saw. Manny Pacquiao is fighting in April, and he’s looking for a tune-up fight. However, Pacquiao’s promoter Bob Arum didn’t seem all that enthralled at the idea of matching him against Khan earlier this year. Arum has the chance to make the fight, but instead he matched Pacquiao with one of his own Top Rank fighters in Jeff Horn. 34-year-old Briedis Prescott (30-11, 22 KOs) should be a consideration for Khan’s March fight. Prescott stopped Khan in the 1st round in their fight 10 years ago on September 6, 2008. Khan never avenged that loss. This would be as good as any for Khan to face the Colombian Prescott to show the boxing world that he’s improved since that defeat. Prescott is now a journeyman having lost 4 out of his last 5 fights at welterweight. ”You’ve got Keith Thurman, which I’d love to have. You’ve got [Errol] Spence. You’ve got the [Danny] Garcia rematch, and the [Lamont] Peterson rematch. There a lot of big names that I know are there to be taken. At 147, I don’t think anyone can push me like Canelo did, because Canelo is a big, big guy,” said Khan. ”So, what I’m saying is the 147 division is the one that suits me,” said Khan.